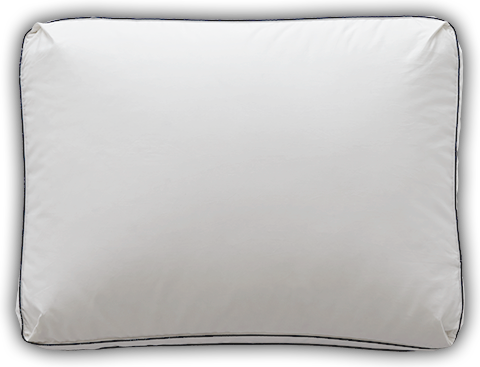 Our loftiest, most poufy all down pillow with patented corner pleating that expands to accommodate the fluffy, billowy fill. This pillow is the ultimate, high sink experience for the down aficionado seeking maximum loft. This pillow helps me sleep with so much comfort, and you can't put a price on that. It is SO WORTH THE MONEY. Everyone deserves a taste of the good life and our premium SuperLoft™ pillow is all that and more. The tufted corners have patented pleating incorporating extra fabric that expands to create our loftiest pillow -- just billowing with fluffy 550 fill power of Hyperclean® down. This pillow lives up to its name giving sleepers the ultimate, high sink experience night after night. A 2” gusset or fabric wall runs around the perimeter of the pillow creating even more room for the fill to reach its maximum pouf. The pillow comes trimmed with sharp navy blue printed cording and features a cover of 500 thread count, 100% cotton sateen for a luxe look and silky feel. This incredible SuperLoft™ pillow can be machine washed and dried for easy care. Our patented SuperLoft™ design combined with a 2 inch gusset makes this pillow our loftiest style with a luxurious, high sink experience. Meticulous pleating in the corners of the pillow open up to provide more room within for the down clusters to fully fluff and expand. Standard: 17" x 23" x 2"
Queen: 17" x 27" x 2"
King: 17" x 33" x 2"